Grasslands are a fast disappearing habitat in the US, making their local protection imperative. From native species habitat, to working lands for cattle, to their ability to store carbon deep in the soil, grasslands are a vital part of Northern California’s iconic beauty and thriving ecosystem. Current research suggests that well-managed grass-fed cattle operations can have a beneficial impact on local ecology. It’s a win-win for cattle ranchers and conservationists. 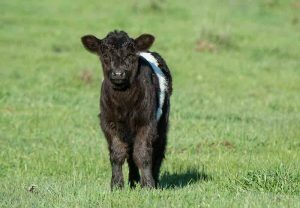 Above is a grass-fed belted galloway calf from Markegard Family Grass-Fed on POST-protected Cloverdale Coastal Ranches. POST is working to improve the health of the grasslands we manage through our partnership with Point Blue, a non-profit conservation science organization and leading voice in innovative rangeland management. Point Blue operates a Rangeland Monitoring Network that currently has 16 partner biologists in 20 counties across California working in the Rangeland Watershed Initiative with funding from NRCS. They are gathering data on soil, plants, birds and grazing in order to better understand the ecological function of California’s rangelands and how they are influenced by different ranching practices. They recently completed the collection of baseline data at nine ranches on the central coast, including POST-Protected Cloverdale Coastal Ranches currently leased by Markegard Family Grass-Fed. Their findings revealed fascinating things about this complex 6,857-acre property and reinforced the importance of protecting this swath of coastal prairie. Point Blue reported over 65 different species of breeding birds on Cloverdale. The proximity of the intact grassland to other habitat, such as the Douglas fir forest along Cloverdale’s perimeter, likely promotes this diversity of bird species. 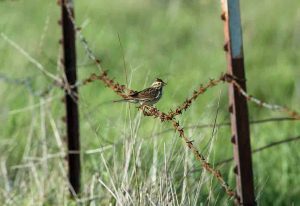 Two grassland bird species, Savannah Sparrows and Grasshopper Sparrows, were very abundant in their bird surveys. Both are indicators of healthy grasslands. Point Blue’s plant inventory also points to healthy grasslands at Cloverdale. They found an especially high abundance of native perennial bunch grasses. Bunch grasses can live up to 100 years and have deeper roots than annual grasses, allowing them to provide nesting habitat for grassland birds, store more carbon, hold more water in the soil and better prevent erosion. Native perennial bunch grasses are usually quite rare, but not at Cloverdale. Look for them when you are on the coast; their movement in the breeze is both unique and captivating. At POST, we use science and data like this to better connect with and understand the health of the lands we protect and to make informed decisions on their long-term care. This data suggests that our ranching partners are grazing the land in ways that produce not just delicious local meat but also thriving grasslands. The next time you go by Cloverdale, or another local grassland, we hope you stop for a moment to enjoy their practical and visual beauty. And if you are lucky, you may be able to hear the song of a Grasshopper Sparrow, which really do sound like grasshoppers!